- The scale can be used to weigh and price the items at any time by connecting with a mobile phone,and can be used as a kitchen scale after hanging the weighing pan. - It can also be used as a mobile phone stand and mobile phone anti-falling buckle. - It is a versatile and very practical and convenient portable scale. LED : Charging indicator. When charging, the indicator lightes up. When it is full, the indicator light goes out. 1. Paste device : Tear off adhesive tape, and stick the WeScale on the back of your phone. 2. Add device : Install APP, and enable bluetooth function of mobile phone, enter the setting interface, follow the prompts to add device. 3. 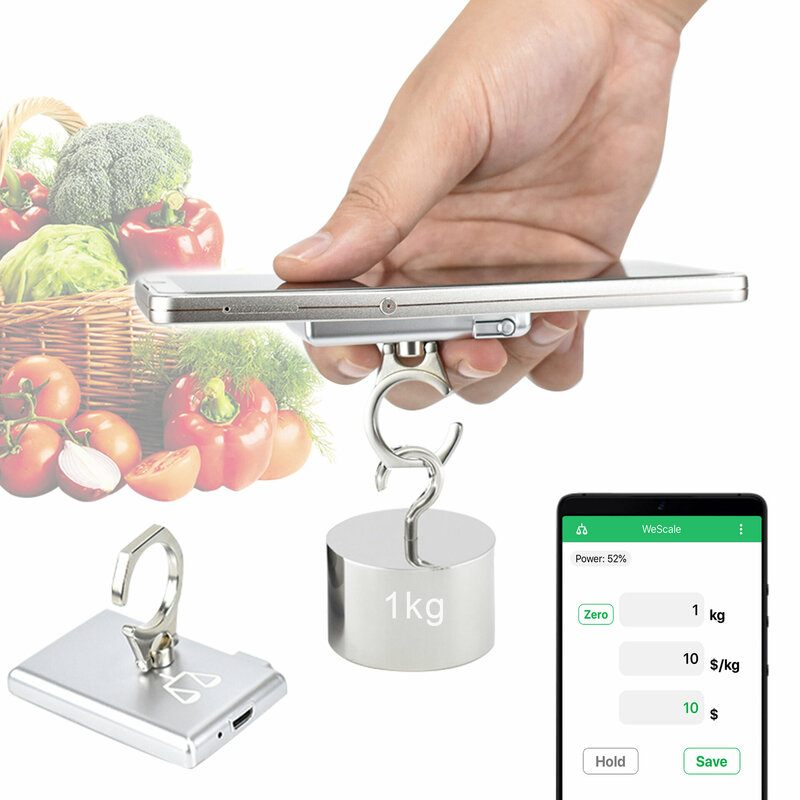 Weighing and pricing : Click on the button of the WeSacle device, then hang the item on the hook and enter the price per kilogram to get the price of the item. 4. Weighing Note : Press the index and middle fingers on the outer casing of the WeScale device and hook the item down. 1. This product contains lithium battery and circuit board. 2. Rain or soaking in water will cause product failure. 3. Do not heat, stress, or destroy internal components. 4. Non-professional maintenance personnel cannot open the product.